SKU: BD28293. Category: Fiction. Tags: basketball, Hoops, Hoosiers, mahem, mystery, Sisters in Crime, stories. Its only a game, you say? Dont you believe it. After that final buzzer, these stories reveal, it may be the games are only beginning. When it comes to Hoosier Hijinks, not everyone plays by the rules. And thats what makes it irresistible;. — From the Introduction by Hank Phillippi Ryan, Emmy Award-winning journalist and author of The Other Woman. Each short mystery is written by a member of the Speed City Indiana Chapter of Sisters in Crime, and each is set around Indiana basketball and separated by an interesting non-fiction piece about Hoosier hoops. Those who have never lived in Indiana (and occasionally, those who do) have a difficult time grasping Hoosier Hysteria. Some describe it as a compulsion, others a fever, still others magic. All agree it’s a manic preoccupation that inflicts itself on Hoosiers during basketball season. From South Bend to Evansville, from Terre Haute to Richmond, basketball fans and players band together forsaking all else except getting the round ball in the netted hoop. All that matters is the game. 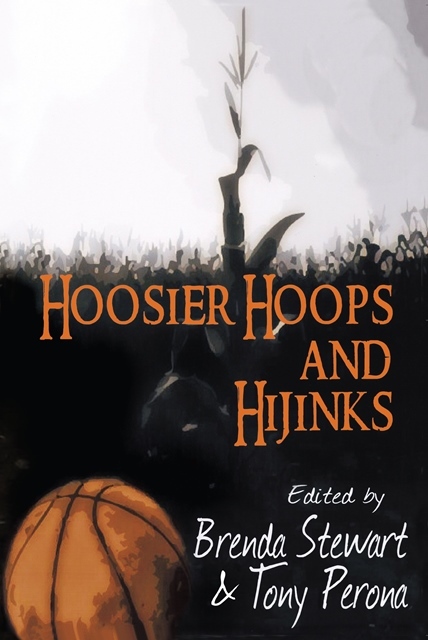 For anyone who loves basketball, Hoosier Hoops and Hijinks is a slam dunk. Brenda Robertson Stewart has been an English teacher, a professional sculptor, forensic artist, ghost writer, editor and the author of Power in the Blood, a finalist in the St. Martin’s first novel contest, was published in 2005. Tony Perona is the author of a mystery series featuring stay-at-home dad/ freelance investigative reporter, Nick Bertetto. He is a member of Mystery Writers of America and has served the organization as Midwest Chapter President and as a member of the national board.